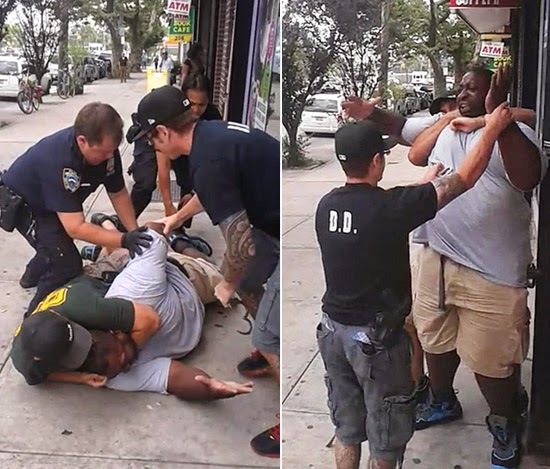 Fourth and Fourteenth: Criminalize the NYPD Chokehold? A proposal was floated today to make it a crime for police officers to use a chokehold like the one used against Eric Garner. My first thought? Unnecessary and useless. Sure, the footage of the assault on Garner was highly disturbing, and the NYPD's apparent refusal to take any steps to rein in the rampant use of the banned chokeholds cries out for political action. But this sort of limited, story of the day legislation misses the point. What is missing, and what has been lacking for years on end has been political will, not available remedies. There are plenty of legal weapons on the books to punish criminally violent officers and deter future misconduct. There are already laws that outlaw the use of violence, like that employed against Eric Garner. What we do not have is the willingness to use them, and until that changes, criminalizing this specific hold or that particular technique won't ever be more than feel-good grandstanding. The idea was set out in today's New York Law Journal by New York City Council Member Rory I. Lancman and his counsel, Daniel Pearlstein. The two discuss the NYPD, chokeholds, and criminal prosecutions, concluding that perhaps the Council ought to pass a new statute criminalizing the use of the hold by police officers. I'm not saying that Lancman and Pearlstein are cynically seeking to ride the angry backlash against the NYPD following the highly disturbing footage of Garner being choked out by a police officer. The suggestion may well have been motivated by genuine concern that officers will continue to flagrantly disregard formal NYPD policy (thus continuing the long-standing informal policy of using chokeholds). There is no dispute that there have been more than 1,000 complaints to the Civilian Complaint Review Board against other officers for using the same sort of hold, that has been banned by the NYPD for over 20 years and that only a small handful have resulted in departmental discipline. Lancman and Pearlstein offer a useful snap shot of the history of the NYPD's treatment of the hold, which was banned outright in 1993. They then discuss P.O. Francis Livoti's infamous killing of Anthony Baez with a chokehold in 1994, after Baez committed the unforgiveable sin of hitting Livoti's patrol car with a football. A rational juror could also have determined beyond a reasonable doubt that Livoti's actions were willful based on his prolonged application of a chokehold—a restraining technique that he knew was prohibited by the New York City Police Department in all situations. They also note that New York State passed Penal Law §121.11 in 2010, which is an A misdemeanor that outlaws the criminal obstruction of breathing or blood circulation. Criminal liability requires proof of intent to obstruct breathing or blood circulation, without the infliction of serious injury. Where the victim dies or suffers serious injury, the charge can be upgraded to felony strangulation in the first or second degree under §§121.12 or 13. For some reason, however, Lancman and Pearlstein then conclude, "a substantial gap remains between existing state law's application to chokehold occurrences and the NYPD's internal rule absolutely banning the technique, calling out for a change in the law." I have to disagree; there are plenty of remedies available, and a misdemeanor statute will only clutter up the landscape. Let's begin with the obvious. Police officers are authorized to use force. It can range from grabbing and cuffing somebody, to tasing, striking with an asp, baton, fist, elbow, etc., or shooting them. The NYPD has all sorts of guidelines in place for when different levels of force can be used. The core issue is whether the force used was reasonable at the time. Clearly, the deliberate use of force when the officer knows it to be unjustified creates potential criminal liability. Which statute depends on the type of force and the nature of the injuries. On a simpler level, when an officer uses more force than what was reasonably necessary under the circumstances, and causes an injury, that officer is civilly liable for violating the Constitution. Police officers are routinely sued for excessive force, often resulting in plaintiffs' verdicts or favorable settlements. Yet, very few officers are ever charged criminally. Why is that? The easy way out is to argue that officers are called upon to make split section decisions, and guessing wrong is not criminal. But the more important point is that prosecutors don't want to bring those cases. The officers will almost always elect a bench trial, and the judges usually exonerate the police (see, e.g., Sean Bell and Amadou Diallo). The problem in most criminal prosecutions of police officers is not that the right laws don't exist, it's the absence of a will to act. I'm not talking about shooting cases that are splashed across newspaper headlines, those are easy calls. I mean charging cops when they punch out a guy because maybe he was a little mouthy, or when they break out the batons and asps to teach someone a lesson. Those are the sorts of prosecutions that could change the way the bad apples on the force behave. It could motivate the NYPD brass to actually try and supervise its officers. But it would require prosecutors unafraid to challenge the department and the unions. Finally, criminalizing a particular hold is just silly. Why should there be a particular statute for a chokehold but not the use of a baton or a handgun? Our political and legal focus ought to be on the obviously fragile relationship between our police force and the public they are supposed to serve and protect. Worrying about chokeholds misses the point entirely: it's the lack of accountability for all sorts of misconduct that is fundamentally problematic. Whether we are discussing bad arrests, indiscriminate uses of unjustified force, racially motivated conduct and policies, or the failure of the NYPD and the CCRB to employ any meaningful discipline against the officers that engage in this conduct, there is never an absence of available remedies. What our government is lacking is the courage to act decisively, to push back against such conduct. Until we have elected leaders willing to do what is right and just, statutes likes those proposed here are just symbolic acts of no import that confuse and distract.